Volvo S90 Review 2019 | What Car? 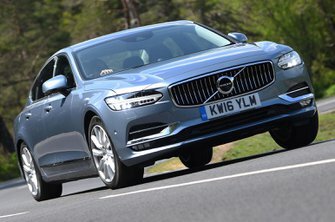 If you’re bored of big Germanic executive saloons, the Volvo S90 could be the breath of fresh Scandinavian air that you’ve been looking for. It's a large executive saloon that shares a platform (and much of its interior) with the V90 estate and XC90 SUV. Engine choices are a pair of 2.0-litre diesels, a 2.0-litre petrol and a powerful petrol-electric plug-in hybrid. A range of trims is available but even entry-level models get plenty of toys as standard. The S90 is priced right up against those premium models from the German Brands, including the very capable BMW 5 Series, Audi A6 and even the British Jaguar XF. Buyers of large executive saloons are a demanding bunch; they expect a comfortable ride, superb refinement, and generous levels of luxury equipment. Is the S90 good enough in these areas to tempt buyers away from those rivals? Read on over the next few pages to find out.